Clarity SI2. Diamond grading is not an exact science. To complicate matters further, no two diamonds are alike. Hence, Diamond grading is an opinion. Considering these factors there will always be a 1-2 grade opinion difference. WILL SHIP IN 12 BUSINESS DAYS! Shape：Round Single Cut. 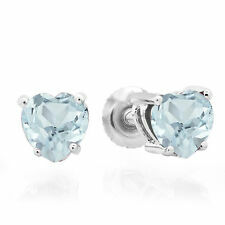 ★Main Stones：100% Genuine Natural Diamonds. Total Gram Weight：1.8 g. Carat Weight：0.4ct. You will get response within 24 hours. we are very glad to help you. Service you wholeheartedly. Main stone:Natural Zircon. 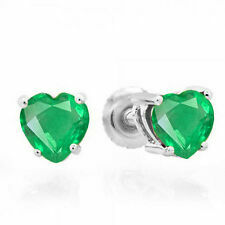 Earrings size:10MM High/7MM High. 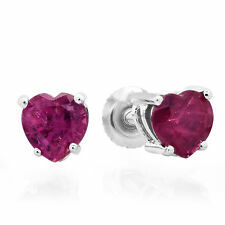 14K White Gold Heart Shape Natural Ruby Ladies Stud Earrings 1 1/3 CT ( 1.30 cttw Red Color I1-I2 Clarity ). Ruby Stone. Heart Cut Shape. Our mission at EcoLuci is to give a woman a piece of jewelry that she's truly proud of and represents her specific and exquisite taste.